Hello Jamie, scanning your posts and this one was unintentional. My eyes was just directed to this post thumbnail so I opened it. But before I saw it, I have asked God if He really loves me because I have a problem trusting that, or believing that with all of my heart, being and soul. I mean, He loves people, yes, others, yes, the world yes, but me? I mean really, personally? As I was reading the post, I have asked a series of questions again and I was amazed that I don’t know, it seemed those words written in your posts just stop me right there and answered me quickly, like every sentence as I am arguing this out with Him. Oh, Jamie. I hope I find Him the way I used to looked at Him, feel Him, and trust Him with all my heart as the child me did. Thanks, Jamie. I’m so glad, Jay. 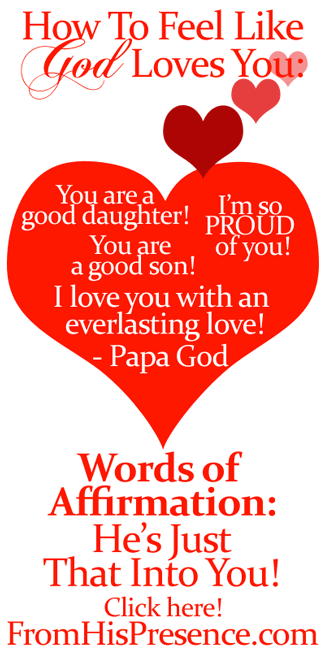 Papa God loves you so much. I just finished reading God’s words of affirmative and I am now fully convince that God really Loves me with all of his heart. thank you for this article it is a Blessing to my Soul. Aaron, thank you so much for letting me know. I’m thrilled beyond words that Holy Spirit helped you sense His love! He does indeed love you with a wild, unending, outrageous love. Thank you for reading my blog! Have a wonderful day! Hi,I just read “He’s that much into you..”,I’m so blessed by all ur posts.I hear Him speak but how do I actually get myself to believe it.I’ve prayed many times n asked God to help me receive His love for me.I’m really struggling in this area.Pls help. I asked, this question a bit ago and didn’t get a “response”. Then I went to church today and a guy who ended up praying for me/us- pointed me out specifically and started declaring that God loves ME. that I am wanted by him and it honestly felt so amazing. Also might I add, that I’m still a teenager, so the whole public declaration felt really nice. thank you dear Jamie, yes it did really comfort me, & encourage me. i love Affirmations of the word. thank you for more. lots of love & God bless you.